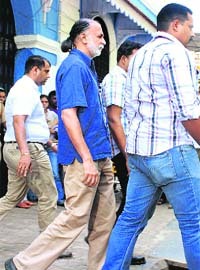 Tehelka founder-editor Tarun Tejpal, accused of sexually assaulting a journalist woman colleague, will remain in custody of Goa Police for four more days. After expiry of his six-day remand today, the 50-year-old journalist was produced before a local court, which extended his police custody till December 10. Cranking up pressure on retired Supreme Court judge AK Ganguly, indicted by the apex court following a sexual harassment complaint by a law intern, to resign as chairman of West Bengal Human Rights Commission, a Union Minister today said it is better for the judge to do so on moral grounds and face the consequences. With the Union Cabinet clearing the draft Bill on bifurcation of Andhra Pradesh and sending it to President Pranab Mukherjee, the focus has now shifted to the rebellious Chief Minister N Kiran Kumar Reddy’s next move to stall the state’s division. The court of Chief Judicial Magistrate (CJM) today deferred the hearing on the bail plea of suspended Additional Secretary JP Joshi, who is in jail for alleged sexual assault of a 26-year-old girl, to December 11. Tejpal, accused of sexually assaulting a junior woman colleague in a hotel here in early November, was arrested by the Goa Police on Saturday last. 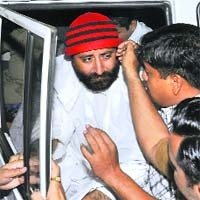 During arguments before Judicial Magistrate First Class Kshama Joshi, his counsel Sandip Kapoor opposed extension of the remand. He said his client has been thoroughly interrogated by police and relevant materials besides the clothes which he wore on the day of alleged incident have been recovered. Public Prosecutor Saresh Lotlikar told the court that many witnesses were yet to be examined and hence further custody of Tejpal is required. The Tehelka founder underwent two rounds of medical tests during his 6-day custody. Three colleagues of the victim-reporter, who has since resigned from the weekly magazine, deposed before the Chief Judicial Magistrate here yesterday. The victim had confided in them about the alleged sexual assault. "The observations that has been made by the Supreme Court panel is 'unwelcome behaviour' (by the judge against the intern)," Union minister Adhir Chowdhury said. "However, in view of the ramifications of the incident, I think on moral grounds, it is better that Justice Ganguly should resign and face the consequences. I wish he comes out with flying colours," Chowdhury said. A Supreme Court committee of three judges had indicted Justice Ganguly for his 'unwelcome behaviour' and 'conduct of sexual nature' towards the intern. The intern has accused the judge of sexual harassment in a hotel room where he had called her, a charge stoutly denied by him. 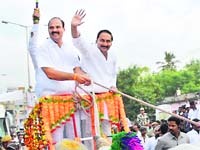 “When the draft Bill comes to the Assembly next week, we will ensure its defeat and send out a strong message to the Union Government that a majority of the people of Andhra Pradesh are opposed to the division,” Kiran told a public meeting in the coastal district of Krishna today. The Chief Minister, who hails from Rayalaseema region, is strongly opposed to the creation of separate Telangana state and has been openly airing his views against splitting AP for some time now. With the UPA government putting the bifurcation process on a fast track to ensure that the 2014 General Election are held in two states of Telangana and residuary Andhra Pradesh, Kiran seems to be preparing for a final showdown with the Congress high command. The Assembly is all set to become a political battleground as the Chief Minister’s camp is making “all-out efforts” to enlist the support of legislators to oppose the draft Telangana bill. The President is expected to send the draft bill to the Assembly on Monday, seeking its opinion. 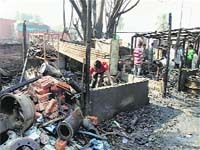 The UPA leadership has already made it clear that the opinion of the Assembly was not binding on the Centre. Under Article 3 of the constitution, Parliament alone has the powers to create new states. However, the Chief Minister and his supporters want to put the draft Bill for voting and get the MLAs, irrespective of their party affiliation, from Rayalaseema and coastal Andhra regions, jointly referred to as Seemandhra, vote against it. The Chief Minister is taking an initiative to defeat an official draft legislation prepared by his own party government at the Centre. According to Congress sources, the Chief Minister has asked his senior cabinet colleagues A Ramanarayana Reddy, N Raghuveera Reddy, G Srinivas Rao and S Shailajanath to ensure floor coordination with the Opposition, particularly the main opposition Telugu Desam party and the YSR Congress Party, to oppose the draft Bill. The Assembly session is scheduled to commence on December 12. Neeraj Chauhan, who was arrested by the police on Friday for allegedly blackmailing Joshi, was sent to 14-day judicial custody after he was presented before the local court here today. The police had arrested Chauhan and the complainant on Friday from Dehradun but the woman was released on personal bond of Rs 25,000. Notably, in his counter complaint filed at Vasant Vihar police station, Joshi has charged both with blackmailing and extortion. The police are now looking for Amit Garg and few other men whose names have come up in the investigation and were allegedly part of the group who blackmailed Joshi over his alleged obscene video clip. The police have already claimed that the girl along with few other men conspired to make the video clip of Joshi for blackmailing him. Chauhan, Garg and the woman have been booked for blackmail and extortion. The police now looking for Amit Garg and few other men who allegedly blackmailed Joshi over his alleged obscene video clip.